Kapila Rishi (Sk.). A great sage, a great adept of antiquity; the author of the Sankhya philosophy. Sânkhya (Sk.). The system of philosophy founded by Kapila Rishi, a system of analytical metaphysics, and one of the six Darshanas or schools of philosophy. It discourses on numerical categories and the meaning of the twenty-five tatwas (the forces of nature in various degrees). This “atomistic school”, as some call it, explains nature by the interaction of twenty-four elements with purusha (spirit) modified by the three gunas (qualities), teaching the eternity of pradhâna (primordial, homogeneous matter), or the self-transformation of nature and the eternity of the human Egos. Sânkhya Kârikâ (Sk.). A work by Kapila, containing his aphorisms. Sânkhya Yoga (Sk.). The system of Yoga as set forth by the above school. Tattwa (Sk.). Eternally existing “That”; also, the different principles in Nature, in their occult meaning. 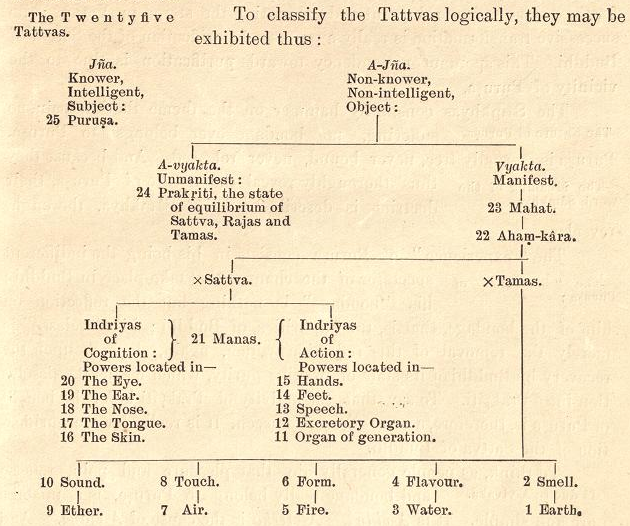 Tattwa Samâsa is a work of Sânkhya philosophy attributed to Kapila himself. Sankhya or Samkhya (Sanskrit) Sāṃkhya [from sam–khyā to reckon, enumerate] The third of the six Darsanas or Hindu schools of philosophy, founded by Kapila, called thus because it divides the universe, and consequently man, into 25 tattvas (elementary principles), of which 24 represent the various more or less conscious vehicles or bodies in which lives and works the 25th, Purusha or the true self. The whole purpose of this school is to teach the essential nature of the universe and of man as an inseparable part of the universe; so that this Purusha — the ultimate thinking spiritual ego, composed in its essence of pure bliss, pure consciousness, and pure being — may be freed from the clinging bonds of the other 24 tattvas. Blavatsky suggests that there was a succession of Kapilas; but that the Kapila who slew King Sagara’s 60,000 progeny was the founder of the Sankhya philosophy as stated in the Puranas. Further, the Sankhya philosophy may have been brought down and taught by the first, and written out by the last, Kapila, the great sage and philosopher of the kali yuga (cf SD 2:571-2). As concerns the 24 tattvas, all derivative from the spiritual originant Purusha, they are divided into eight original prakritis (producers), and 16 derivatives of these eight prakritis called vikaras (productions). The eight prakritis themselves spring forth from mulprakriti (original nature or root-substance). In and through these 24 tattvas Purusha manifests itself during the manvantaric period. This system of tattvas therefore is applicable either to the universe or to any entity as a component part of the universe, since the fundamental law of things repeats itself in the great and the small. The Sankhya school is closely related both in system and philosophical substance to the Yoga school founded by Patanjali. Sankhya-karika or Sankhya-saptati (Sanskrit) Sāṃkhya-kārikā, Sāṃkhya-saptati A well-known textbook of the Sankhya philosophy; a collection of 72 verses by Isvara-Krishna, perhaps the oldest extant systematic exposition of the Sankhya system. Sankhya-sara (Sanskrit) Sāṃkhya-sāra A work on the Sankhya philosophy by Vijnana-bhikshu. Sankhya Yoga, Samkhya Yoga (Sanskrit) Sāṃkhya-yoga The realization, union, or at-one-ment with the higher self by the methods of the Sankhya system of philosophy. It is treated of in the second chapter of the Bhagavad-Gita. The Purâna is in duty bound to speak as it does. It has a dogma to promulgate and a policy to carry out — that of great secrecy with regard to mystical divine truths divulged for countless ages only at initiation. It is not in the Purânas, therefore, that we have to look for an explanation of the mystery connected with various transcendental states of being. That the story is an allegory is seen upon its very face: the 60,000 Sons, brutal, vicious, and impious, are the personification of the human passions that a “mere glance of the sage” — the SELF who represents the highest state of purity that can be reached on earth—reduces to ashes. But it has also other significations — cyclic and chronological meanings, — a method of marking the periods when certain sages flourished, found also in other Purânas. Now it is as well ascertained as any tradition can be, that it was at Hardwar (or Gangadwara, the “door or gate of the Ganges”) at the foot of the Himalayas, that Kapila sat in meditation for a number of years. Not far from the Sewalik range, the “pass of Hardwar” is called to this day “Kapila’s Pass”; and the place, “Kapilasthen,” by the ascetics. It is there that Ganga (Ganges) emerging from its mountainous gorge, begins its course over the sultry plains of India. And it is as clearly ascertained by geological survey that the tradition which claims that the ocean ages ago washed the base of the Himalayas — is not entirely without foundation, for there are traces left of this. The Sankhya philosophy may have been brought down and taught by the first, and written out by the last Kapila. Now Sagara is the name of the Ocean, and even of the Bay of Bengal, at the mouth of the Ganges, to this day in India (Vide Wilson’s Vishnu Purâna, Vol. III. p. 309). Have geologists ever calculated the number of millenniums it has taken the sea to recede to where it is now, from Hardwar, 1,024 feet above the level of the sea at present? If they did, those Orientalists who show Kapila flourishing from the 1st to the 9th cent. 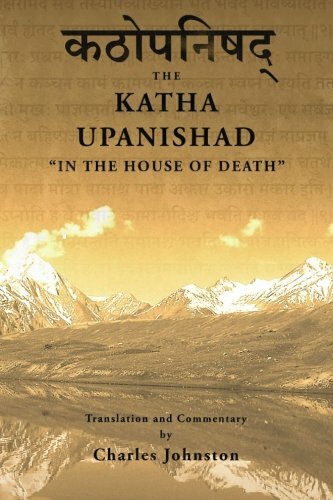 A.D., might change their opinions, if only for one of two very good reasons: the true number of years elapsed since Kapila’s day is in the Purânas unmistakably, though the translators fail to see it. And secondly — the Kapila of the Satya, and the Kapila of the Kali-Yugas may be one and the same INDIVIDUALITY, without being the same PERSONALITY. Kapila, besides being the name of a personage, of the once living Sage and the author of Sankhya philosophy, is also the generic name of the Kumâras, the celestial ascetics and virgins; therefore the very fact of Bhagavata Purâna calling that Kapila — which it showed just before as a portion of Vishnu — the author of Sankhya philosophy, ought to have warned the reader of a blind containing an esoteric meaning. Whether the Son of Vitatha, as Harivansa shows him to be, or of anyone else, the author of Sankhya cannot be the same as the Sage of the SatyaYuga — at the very beginning of the Manvantara, when Vishnu is shown in the form of Kapila, “imparting to all creatures true Wisdom”; for this relates to that primordial period when “the Sons of God” taught to the just created men the arts and sciences, which have been cultivated and preserved since then in the sanctuaries by the Initiates. There are several well-known Kapilas in the Purânas. First the primeval sage, then Kapila, one of the three “Secret” Kumâras; and Kapila, son of Kasyapa and Kadrû — the “many-headed Serpent,” (See Vayu Purâna placing him on the list of the forty renowned sons of Kasyapa), besides Kapila, the great sage and philosopher of the Kali Yuga. Being an Initiate, “a Serpent of Wisdom,” a Nâga, the latter was purposely blended with the Kapilas of the former ages. The Sacred Books of the Hindus, Volume XI: Samkhya Philosophy (including translations of the principle Sankhya texts), tr. Nandalal Sinha, 1915. From the Introduction to The Sacred Books of the Hindus, Volume XI: Samkhya Philosophy, tr. Nandalal Sinha, 1915.